Beside my primary school was a church, St Stephen’s. In the summer, house martins built their nests under its eaves and whizzed over our heads as we came and went or played in the yard on wet days. Just as the house martins were leaving at the end of the summer, the autumn term started. Soon after, we had a harvest festival. The abiding notion in Britain is that school summer holidays freed up children to help with the harvest. This may be a myth, but certainly the biggest grain harvests start happening here in the middle of school holidays, around the festival of Lammas, 1 August. Harvest festivals continue through late summer and autumn, notably occurring around the time of the nearest full moon to the autumnal equinox. This year, the equinox is today, 23 September, the full moon 28 September. Though our local primary school is doing its harvest festival on 16 October. I’ve not seen how they do it yet, but I’ve got strong memories from a couple (several) decades ago of the festivals at St Stephen’s, with the altar piled high with foods, to give thanks and for charity. There were tinned foods, but there was also fresh autumn produce, and possibly even a wheat sheaf: real or made of dough. A sheaf is a tied bunch of grain stalks after they have been harvested. It was a common sight at this time of year during the centuries when harvests were done by hand with scythes. I did it this way when I lived on a small farm in New Zealand in 1990, and I know people these days growing heritage grain varieties that still do in England, but mostly harvesting is done now with combines: so no more sheaves. It’s a shame really, as they’re an ancient symbol and one that you’re more likely to encounter now in pub names. 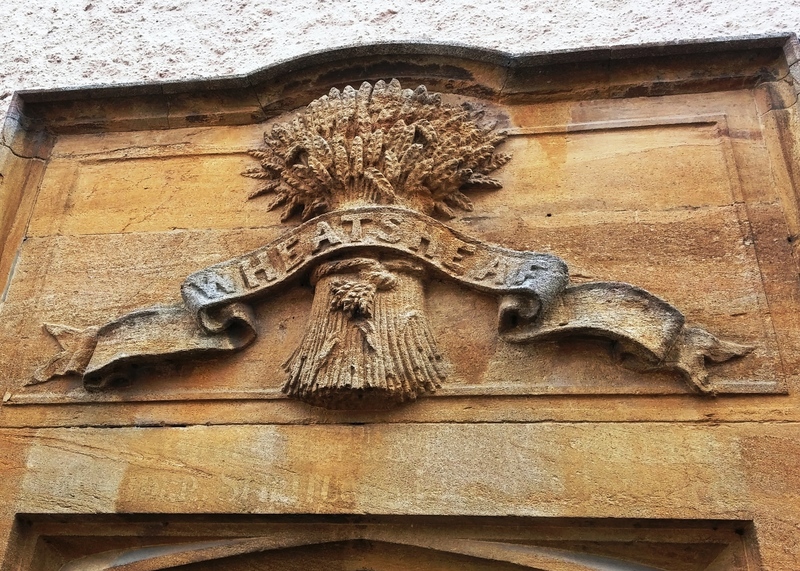 Symbolically, however, the wheat sheaf represents plenty, a good harvest, fertility and even resurrection, as the cycle of seasons has once more given grain for bread. 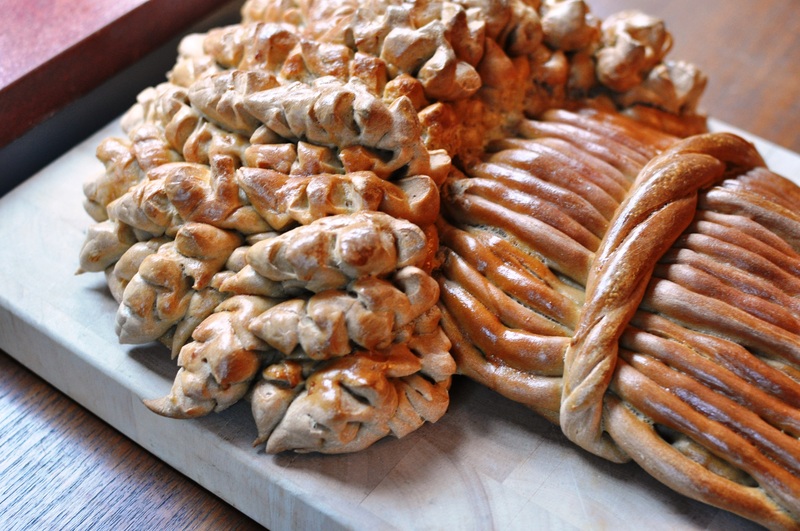 Indeed, the sheaf infers bread, and bread is of course a quintessentially important symbolic food in some religions. The heart of Christianity is the eucharist: the eating of bread to reiterate the Last Supper, where Jesus prepared for his sacrifice by shared bread, saying, “This is my body, which is given for you. Do this in remembrance of me.” (Luke 22:20). 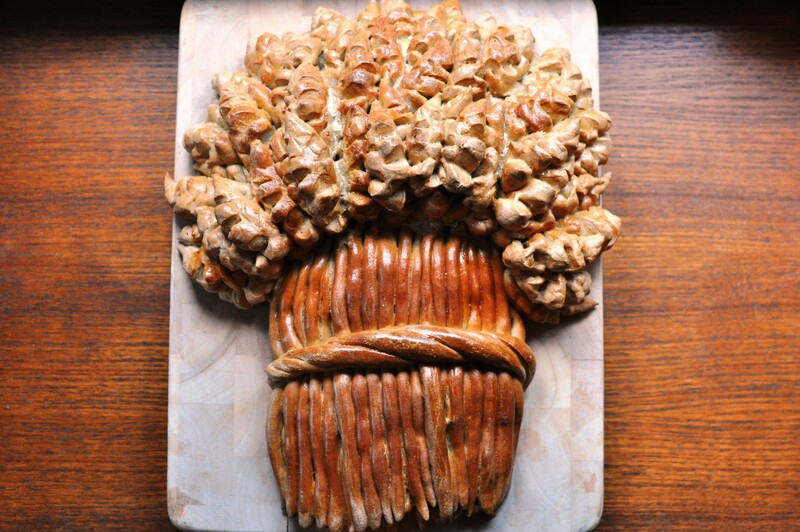 Although I’m not religious, I enjoy the symbolism and stories, and most of all appreciate the tradition, so I thought it was about time I had a go at a bread wheat sheaf. It’s based on the recipe in The Bread Book by Linda Collister (1993) which is in turn based on a recipe in The Modern Baker, Confectioner and Caterer (1907) by John Kirkland, a former head of The National Bakery School (founded 1894), then at Borough Polytechnic and now part of London South Bank University. I did a diploma there in 2010, but we didn’t make anything quite this ornate. This is slightly tricky to do in a domestic oven as it won’t be as capacious as a commercial oven. Mine can cope with baking sheets 35cm wide. It’ll mean your sheaf isn’t as grand as those professionals might make for harvest festivals, but even the comparatively stumpy results can still be very pleasing. 1. Combine the yeast and most of the water. Hold say 100g back. 2. Put the flour, sugar and salt in a large bowl and mix to combine. 3. 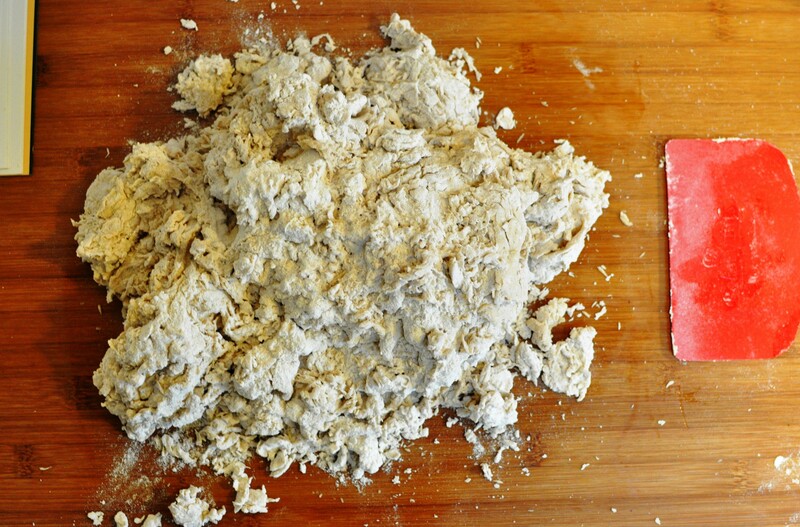 Add the yeast mixture and bring to a dough. 4. It will be quite a tight, firm dough as you want it for sculpting, however if it feels too dry add a little more of the water. 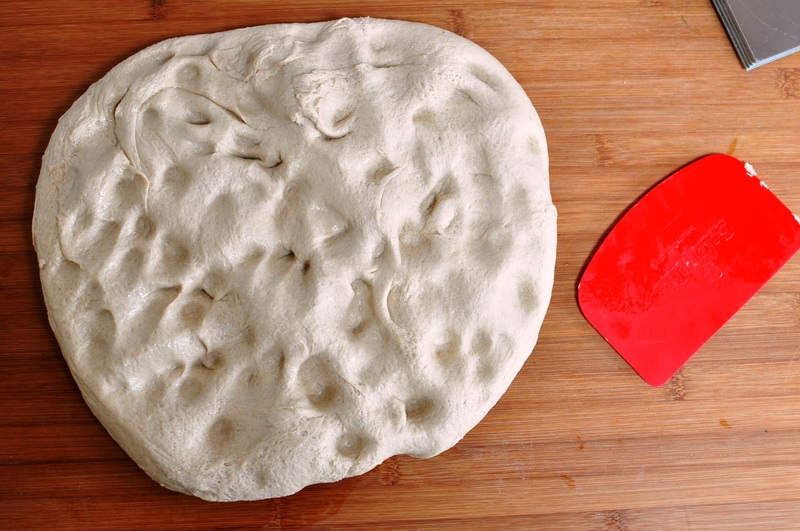 How dry your dough feels will depend on how absorbent your flour is. As I’m using a stoneground flour, which contains more bran than an industrial steel roller-milled flour, it’s quite absorbent. 5. Turn the mixture out onto a lightly oiled surface and knead until smooth and well combined. 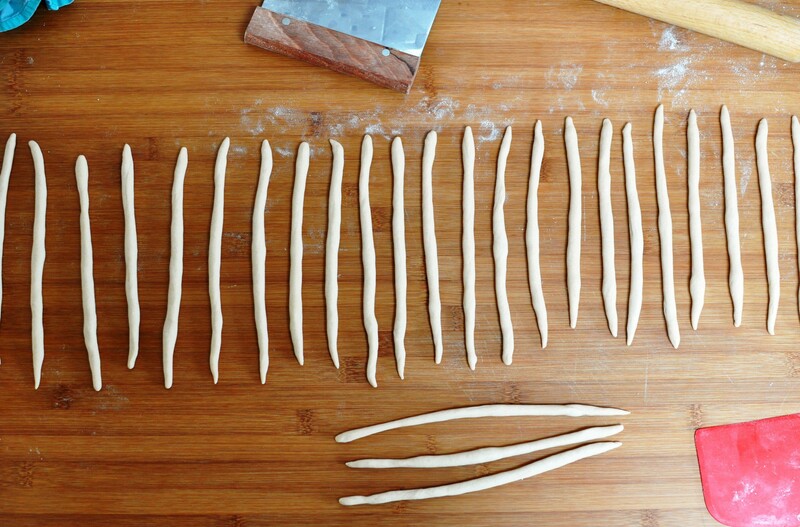 These days I rarely do long manual kneads, but as this is quite old-school, go with it. 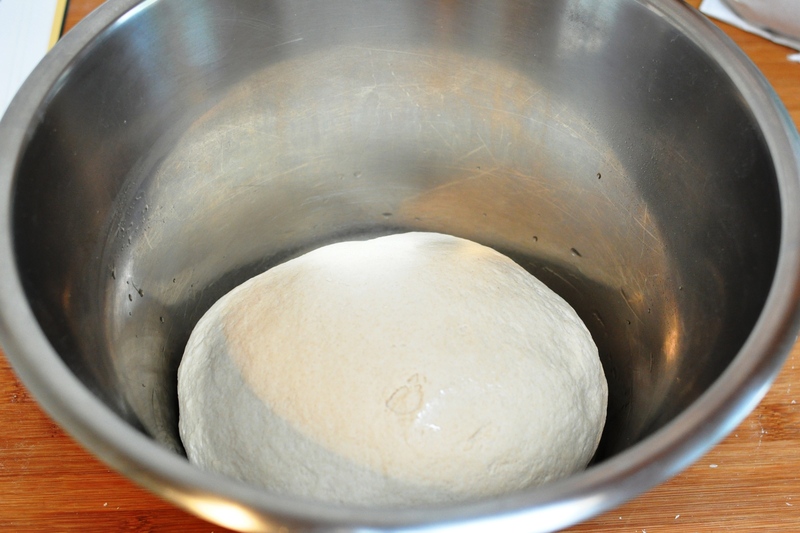 I added water to a total of about 750g – meaning the dough is 55% hydration. 6. Return the ball of dough to the bowl (cleaned and lightly oiled), cover or put in a plastic bag, then leave to prove until doubled in size. At an ambient temperature of about 18C this too about two and half hours. 7. When doubled, turn out. 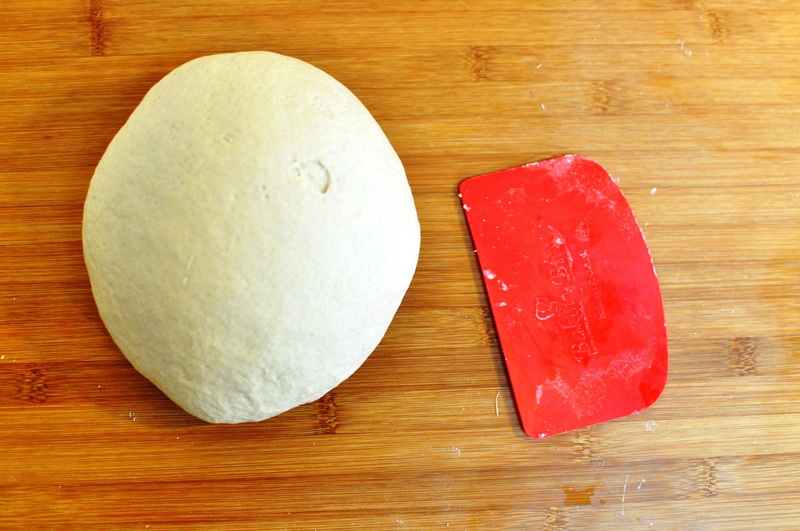 My total dough weighed approximately 2150g. 8. 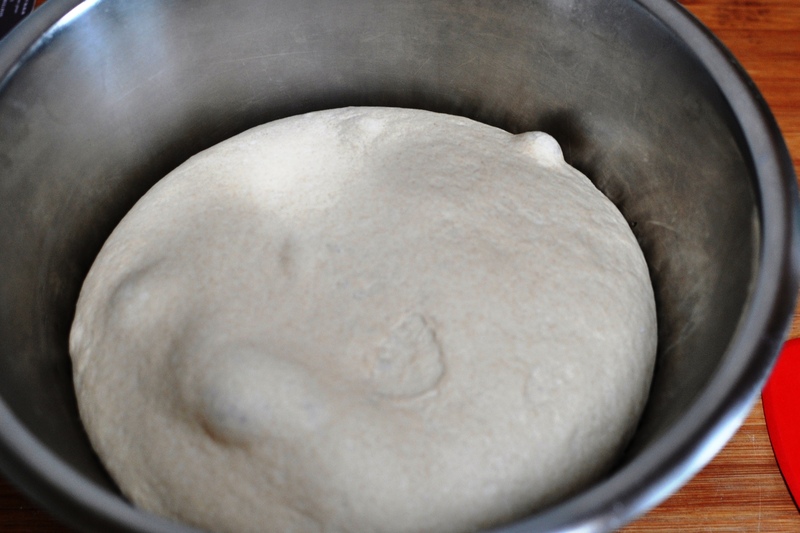 Give the dough another short knead to deflate and redistribute the gases. Again, this isn’t a loaf where we’re after a nice pleasing crumb, it’s a medium for sculpting. 9. 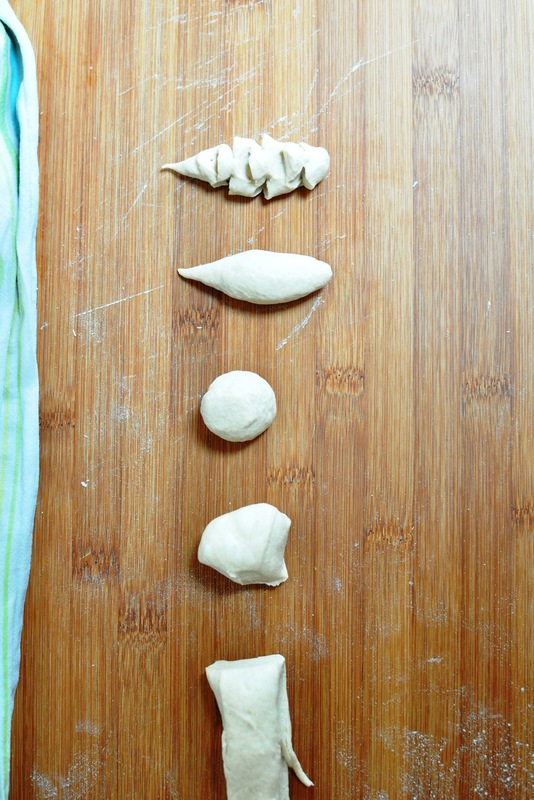 Divide the dough up into pieces: two at 320g, one at 400g and the rest, about 1110g. 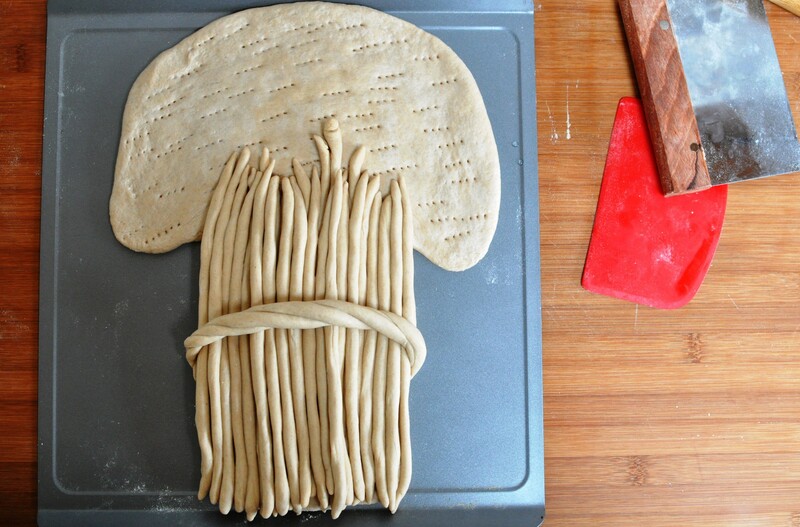 Don’t worry too much about total accuracy – you’re making a wheat sheaf, an organic thing, not something geometric. 10. As this is quite a protracted process, you might want to keep the pieces you’re not working on in the fridge, so they don’t keep proving and swelling too much. Too much proving and the resulting shape may crack where you don’t want it to. 11. Take the two 320g pieces and form two rough rectangles, approximately 22x13cm. Use one to form the trunk of the sheaf, the other the top. Place both pieces on the largest baking sheet you have (that’ll fit in your oven of course). Stretch the head out slightly. You want a kind of cartoon tree or mushroom shape. Prick all over with a fork and brush with water to stop a crust forming. Cover with a damp cloth while you do the next bit. 12. Take the 400g piece and divide it into 30 pieces, each scaled at around 13g. 13. Roll these pieces into snakes, again about 22cm long. 14. Place 27 of the snakes on the base, making the wheat stalks. 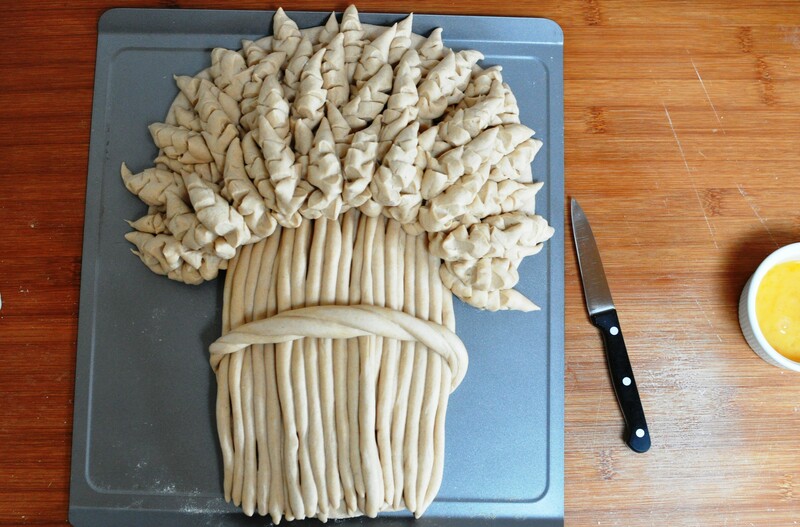 Twist or braid the remaining three to form a sheaf band, tucking its ends underneath on each side. 15. Cover or bag this and place it in the fridge as the next bit is the most time-consuming. 16. 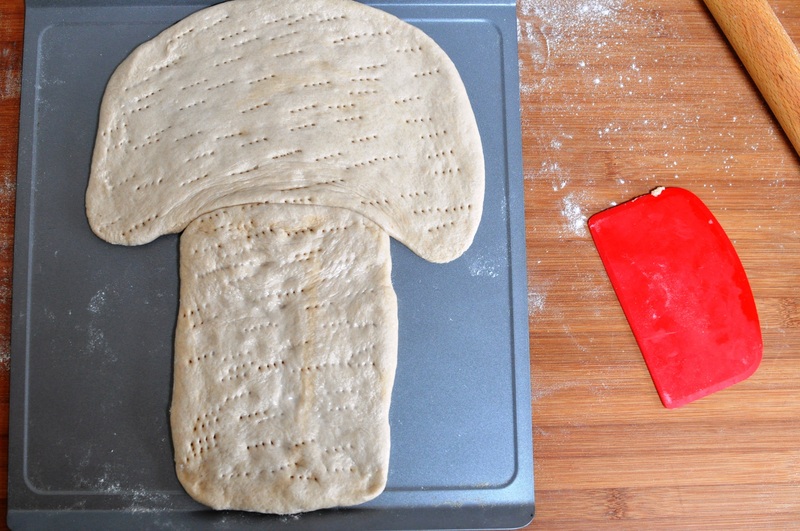 Take the large, remaining piece of dough. This is to create to ears. Divide it up into about 70 pieces, each scaled at 16g-ish. Do more, smaller pieces if you want daintier ears. 17. Roll each piece into a ball, then roll out, rolling one end to a point. 18. 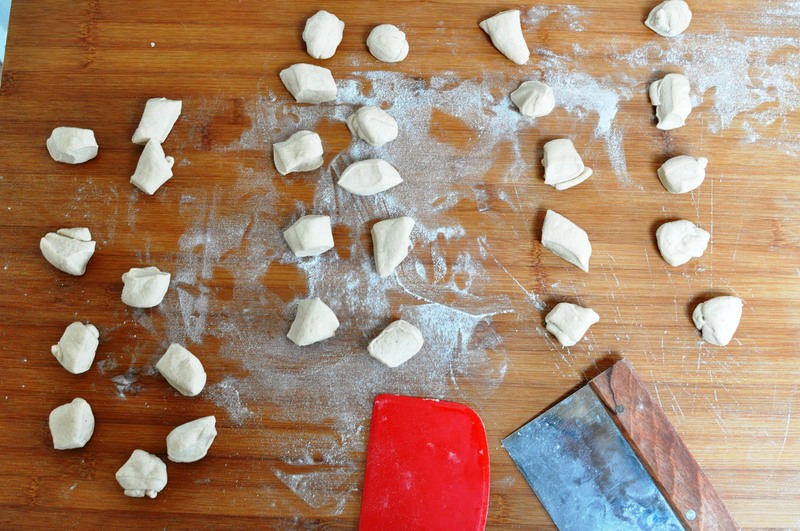 With a pair of sharp-pointed scissors, make snips in the small piece of dough, three or four, on three sides. Cut down and inwards towards the rounded base. 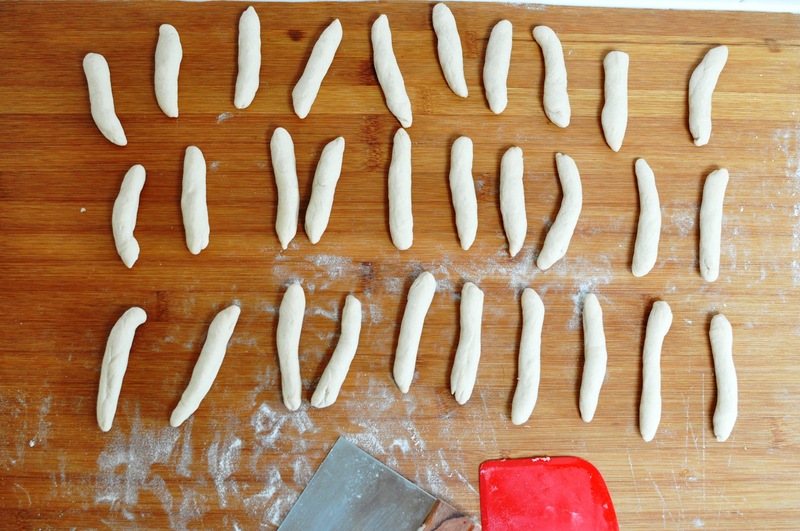 It’s a bit like making dozens of mini versions of the French pain d’épi – meaning ear or cob bread. 19. You could make all of them in advance, but I got the main part out of the fridge again, and started positioning them on the top. Place them loosely to give a sense of them having grown out of the stalks. 20. While you’re doing this, preheat your oven to 220C. 21. Keep adding the ears, layering slightly, with the thickest point in the middle. 23. Beat the one egg with the pinch of salt and use it to – carefully and lightly – glaze the sheaf. 23. Bake for 20 minutes, take out of the oven and brush with more egg glaze. 24. Turn the heat down to 170C and bake for another 40 minutes or so until nicely browned. At this point, you can decide whether you want to eat it – it’s a perfectly serviceable, albeit low hydration, bread – or use it as a decoration. If you want it for the latter, turn your oven down to 140C or 130C and leave it in for a few hours longer to completely dry it out. Collister says six hours and if you have a wood or oil range, maybe you could just leave it in, but using electricity this seems a bit excessive in terms of energy consumption. Collister decorates hers with a blobby little mouse on the stalks. If I’d been doing this with children in the house I might have been tempted, but as our adoption process continues to drag us along on its emotional roller-coaster, and we still haven’t been able to expand our family, I wasn’t inclined. It’s easy to make a mouse though – just save 30g or so of the dough used for the wheat ears, make it into an eggy shape, snip a few ears, skewer a few eyes and add a snaky tail. I don’t think the mouse has any particular symbolism, though I could be wrong. Maybe it today it could symbolism how biodiversity is so tragically compromised by modern industrial farming techniques. So I dried out the wheat sheaf loaf – every time I used to oven for other things, then turned it off, I put the loaf back in to dry while it cooled. 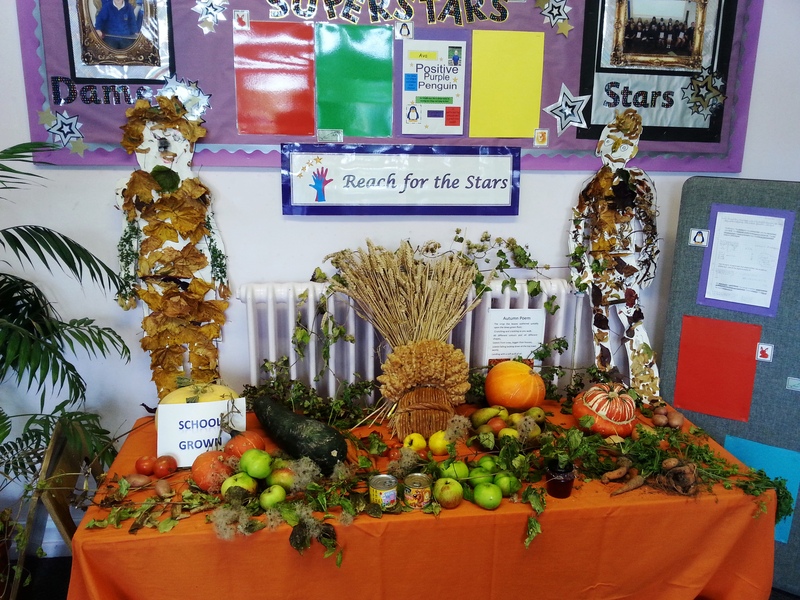 I gave it to the local primary school, where I volunteer, and they used it as part of their harvest festival display. It’s a nice echo of my own memories of harvest festival at my primary school, all those years ago. 1. Here’s a film of a British master baker making a wheat sheaf in 1957. His wheat ears are a bit finer than mine! 2. Out of interest, Fran, my wife, works at Kew Foundation, at Kew Gardens in London. As I was doing this, she was working on a document that contained this remarkable statistic. While the human genome contains 3 billion letters, that of bread wheat (Triticum aestivum L. ) contains 17 billion. I’m not a scientist – clearly – but that’s boggling. The human sense of superiority leads one to imagine a sophisticated, sentient animal organism like us would be that much more genetically complicated. 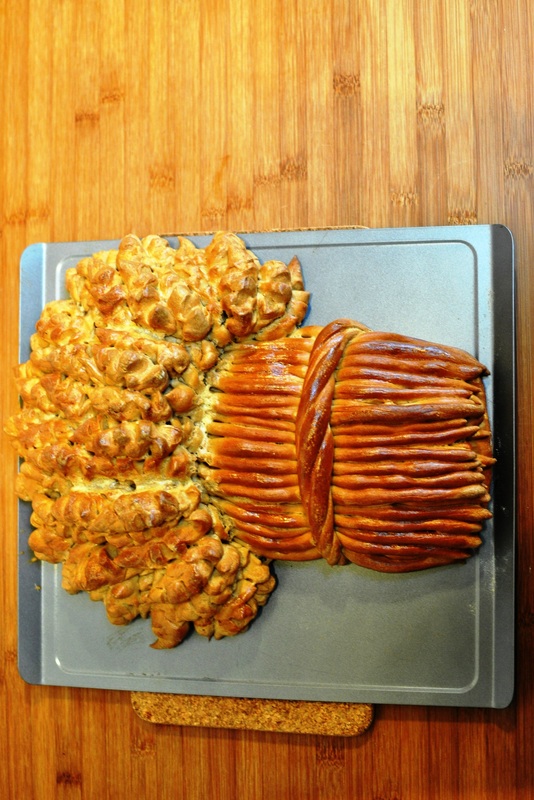 Ha, how weird is this – we made our first harvest loaf last night. You’re right it took ages doing all those ears. My youngest had asked me to make the dough so that we could make one when she got home from school. It took us about an hour and a half to put it all together. I was so blooming chuffed with it, I kept taking pictures and telling my girl how brilliant it was. Ha, that is a coincidence. Are you blogging yours too? Intrigued to see what it looks like! Was it for a harvest festival at the school? We went to a local historic farm on Sunday to see them baking theirs in the cottage’s traditional bread oven. That was very exciting; they had used faggots to get it to temperature and the oven will take 18 loaves! I want one. It inspired us to try one this week. Although I am volunteering to teach a bread class at a community harvest festival soon so might make one to take there now that I know I can do it. Sounds interesting. Where is that? Acton Scott, the one used for the Victorian Farm series with Ruth et al. If I do blog mine, can I be cheeky and link to your post for the information and instructions? Sure. Mine’s just a version of Collister’s, which is just a version of Kirkland’s anyway. What a fantastic looking loaf, Daniel. And what a fiddle. How does it taste? I think I will send the link to headteacher at St Peters school, who I no longer know as s/he has changed. Can’t bring myself to cut it. So I think it might become a decoration, possibly for the local school if it lasts. The loaf looks beautiful Dan,I admire all your hard work and patience. I’m not surprised you don’t want to cut it, I don’t think I could either. This is such a good ready, Daniel, thank you so much! What an amazing labour of love! My first reaction – your harvest loaf is beautiful. That is also my second, third, and more reaction. Well worth all the effort! it’s a beautiful thing! and you did it very speedily. Whew! What a faff but well worth it in the end – I’m letting mine dry out for a couple hours in the oven now. Thanks for the great set of instructions! Yes, a faff indeed but satisfying. I’ve dried mine out now too: whenever the oven was on I put it back in while the oven cooled. Yes, couldn’t bring myself to cut it, so have dried it out to use as a decoration for harvest festival.